Texting is without doubt, the best medium to get a message or alert through to someone, wherever they are. Z-text takes advantage of Fixed Line SMS. No internet access or pre-payment is required; texts are charged to the telephone bill, just like any other call. The Z-text SMS Modem has the same AT command set as a GSM modem (GSM 07.05), which it can directly replace without modification of the host application in most cases. Text and PDU Mode are supported. In addition to being a very convenient method of sending text messages, the Z-text SMS modem is ideal for reporting alerts from environmental and network monitoring systems. 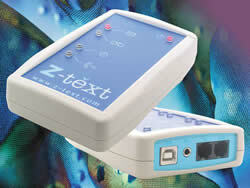 Z-text is suitable for use with worldwide networks that have implemented Fixed Line SMS Protocol 1. These include the UK, Europe, Asia, South Africa, and Australia. USB drivers are available on request for Linux 2.4, 2.6, and MAC OS9, OSX. Our Technical section contains information about Fixed Line SMS around the world, and details on interfacing with bespoke applications via simple AT Commands. Developers working with integrating the Z-text SMS modem with their own applications now have access to beta releases of firmware and additional technical information. Contact us for access details. Fixed Line SMS has many advantages over GSM based solutions in that no SIM or contract is required, and signal strength is no longer an issue. Internet based SMS solutions are far from ideal. They have complicated payment methods, and messages can take a considerable time to reach their destination.